The very beautiful duo of Jennifer Lawrence (Joy) and Chris Pratt (Guardians of the Galaxy) star in the sci-fi adventure thriller Passengers. The film’s story centers on, not surprisingly, two passengers, Aurora (Lawrence) and Jim (Pratt), who are on board a spaceship transporting them to a new life on another planet. The trip takes a deadly turn when their hibernation pods mysteriously wake them 90 years before they reach their destination. As the pair tries to unravel the mystery behind the malfunction, they discover that the ship itself is in grave danger. With the lives of 5,000 sleeping passengers at stake, only Jim and Aurora can save them all. Oh yeah, and this is a good time to mention that Jim woke up first, and then took theliberty of awaking Aurora several months later because he liked her digital profile and thought she was really hot…! The movie was directed by Academy Award nominee Morten Tyldum (Best Director, The Imitation Game, 2014) and also features Michael Sheen (Twilight franchise) and Laurence Fishburne (Contagion). 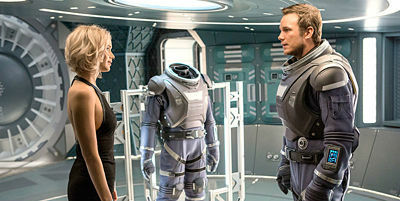 As for bonus features, the 4K Ultra HD, Blu-ray, DVD and digital releases of Passengers contain with three featurettes, plus “Outtakes from the Set.” The Blu-ray and digital release include additional exclusive material, including deleted scenes, the featurette “Space on Screen: The Visual Effects of Passengers” and a first look at the Passengers Awakening Virtual Reality Experience. The critics didn’t dig this one, which can be plainly seen with its 31% Fresh Rating at Rotten Tomatoes based on 220 published review. But audiences checked it out anyway—elevating it to a not-bad $100 at the domestic box office and another $200 million abroad.